The Leak and Potato Risotto from Belvedere is a natural product made without preservatives and without monosodium glutamate (MSG). 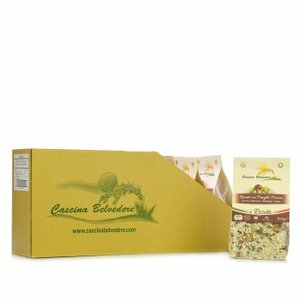 It only contains genuine selected ingredients: Carnaroli rice, potatoes, leaks, sea salt, extra virgin olive oil, rice flour, carrots, celery, soy miso, herbs and spices. It is a perfect product because it is ready in a few minutes, either in a pan or in the microwave. Ingredients Carnaroli rice 88%, potatoes 4%, leek 2.8%, natural salt, rice flour, onion, celery, carrot, parsley, extra virgin olive oil, maize starch, miso (soy, rice, water, salt, Koji), yeast extract, spices. For more information on product labels, please contact our Customer Service department. The information on the labels of the products may vary for reasons beyond our control, therefore, there may be discrepancies between the information on the site and that on the products delivered. Please always check the information on the product before consumption or use.